An EMERCOM truck on duty at Vorkuta's Severnaya coal mine. The underground fire is still raging in the damaged Severnaya mine in Vorkuta, Russian Emergency Situations Minister Vladimir Puchkov has said. "The fire continues to burn, and the situation is complicated. The technical board is at work, it has almost prepared decisions regarding further technological works in the mine," Puchkov told reporters on Feb. 29. Scientists, specialists and experts are working out scenarios for Severnaya, the minister said. Rescuers have regrouped, and underground works have been suspended. 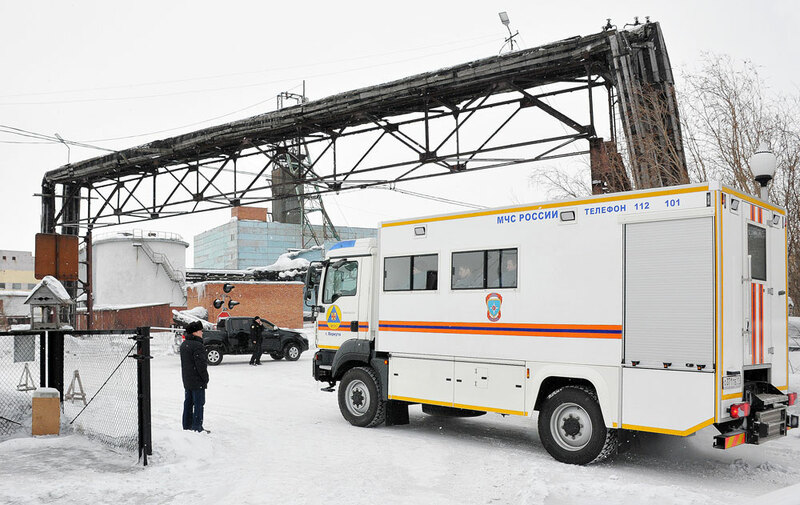 The accident in the Severnaya mine occurred on Feb. 25. A sudden discharge of methane and two explosions occurred at a depth of 780 meters and rock collapsed. A fire broke out behind the collapsed rock. Eighty-one out of 111 miners were evacuated to the surface, and nine of them required medical attention. Four bodies were found at the accident scene. Twenty-six missing persons were declared dead. A third explosion shook the mine during search-and-rescue operations early in the morning of Feb. 28. Six people died, five of them rescuers and one mine worker. Another five suffered injuries. Arkady Dvorkovich, Deputy Prime Minister in charge of the governmental commission assisting accident victims and families of the dead, told the press that the accident had taken 36 lives, including those of rescuers.